With dozens of Kentucky’s finest artists attending The Kentucky Crafted Market, March 2-4 at the Kentucky Exposition Center in Louisville, visitors have the unique opportunity to view and purchase items from the largest gathering of Kentucky-based artists under one roof. Among the artists are several who will be showing at The Market for the first time. Today, we’ll meet printmaker Joanne Price and photographer Ted Tarquinio. I studied printmaking at Buffalo State College in New York and continued at the University of Minnesota where I received a master’s degree in fine arts. I honed my craft at Highpoint Center for Printmaking, and have collaborated with several established and emerging artists like Julie Mehretu, Carlos Amorales, Santiago Cucullu, David Rathman. The result of these collaborations can be found in the collections of museums like the Museum of Modern Art in New York City, the Hammer Museum, Walker Art Center and the Whitney Museum of American Art. I became a Kentucky Crafted Artist in 2014, so I’m in my fourth year. 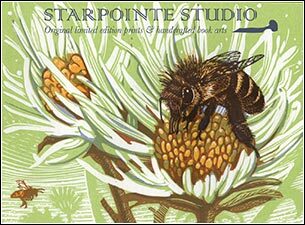 Starpointe Studio specializes in creating original prints and unique handcrafted artist’s books, journals, and boxes that advocate quality, a sustainable life, and professional practice on our fine Earth. The prints are all hand-drawn, hand-cut in wood and printed on antique printing presses. My rural landscape has sparked a curiosity that demands closer examination of the insect and plant life I am surrounded by, creating compositions that combine micro and macro perspectives with sharp and fresh imagery. In addition to participating in national and international exhibitions, highlights include receiving an Artist Initiative grant from the Kentucky Foundation for Women in 2017 and a fellowship from Bernheim Arboretum and Research Forest in 2014—both working towards an artist’s book project about beneficial insects. I am proud to collaborate with Larkspur Press, creating illustrations for “Planting Trees” by Wendell Berry and for “Affrilachian Sonnets” by Frank X Walker. I also received a Jerome Book Arts Fellowship grant and support from the Minnesota Center for Book Arts to create the artist’s book, Palm Tree Story in 2009. What are you looking forward to about showing at The Kentucky Crafted Market? I’m excited to participate in an art fair in Louisville and to experience The Kentucky Crafted Market as an exhibitor for the first time. After college, I traveled all over the Western Hemisphere as a wilderness backpacker where I discovered a natural eye for landscape photography. I cultivated that raw talent into what has been a 17-year career as a professional photographer with the help of various accomplished landscape and equine photographers. This is my first year at Kentucky Crafted. Every finished photo you’ll see is a 100 percent handmade, limited-edition original and has only been in my hands through the entire process including shooting the image, printing the photo, custom mat cutting, mounting, framing along with hand signing and numbering each image. Each photograph has been printed from my high-resolution master original file showing the maximum detail and clarity of the image. I’ve had the privilege of doing photo shoots throughout the Western Hemisphere including Patagonia, Alaska, Peru, Hawaii, the Caribbean and all over the United States. I’ve spent the last 10 years focusing on my home state of Kentucky where I have won various photography awards from the Society of Professional Journalists. I also documented the entirety of American Pharoah’s historic 2015 Triple Crown and Breeders’ Cup victories. The Kentucky Derby Museum in Louisville, which sells my finished work, used my photos to build the museum’s American Pharoah Exhibits. I am most looking forward to building new relationships with retailers to sell my work on a wholesale basis, which is a big part of my business. I serve clients all over the state including galleries, stores and museums. It is also an honor to be a peer to the select artists that are accepted to the Kentucky Arts Council’s adjudicated Kentucky Crafted program. On Saturday we’ll meet Chao Ma, Justine Riley and Elizabeth Foley. Among the artists are several who will be showing at The Market for the first time. Today, we’ll meet fiber artist Kim Mahlbacher and blacksmith Brad Holman. I love sheep and what can be done with their wool. I am a self-taught artist. “Art which comes to life with imagination.” My sculptures are uniquely poseable, allowing the buyer the fun of their own creative touch. My work encompasses woodland creatures, faeries, wild and domestic animals, gentle Nativities and botanical. Each piece captures a whimsical joy-filled spirit where the buyer will find a gentle smile, a mischievous wink or perhaps even the unbridled imagination of remembered childhood dreams. 2017 Kentucky State Fair Crafts Gallery Folk Art Best in Show and Dolls and Toys Sweepstakes winner, 2018 Kentucky Visions at the Capitol exhibit artist. I love sharing my art, and especially meeting and interacting with visitors at my booth. I worked as a machinist for most of my life before becoming a self-taught blacksmith. 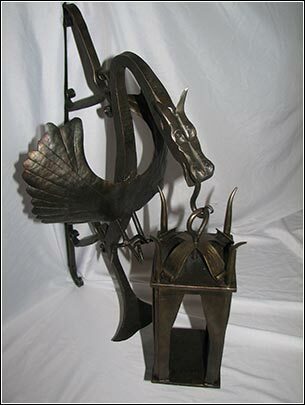 Most of my work is created using traditional forging techniques to create original and functional pieces. I enjoy using traditional joinery in my work as much as possible. Third place in metal sculpture category at the 2016 Kentucky State Fair; first place in metal sculpture category at the 2017 Kentucky State Fair; winner in the metal category at the 2017 Woodland Art Fair. I’m looking forward to meeting new clients and customers and participating in a show that has such high-quality offerings from great local artists. On Wednesday, we’ll meet printmaker Joanne Price and photographer Ted Tarquinio! Here are messages of thanks and acceptance from recipients of the 2017 Governor’s Awards in the Arts, which were handed out Feb. 2 at the Governor’s Mansion in Frankfort. More messages will be added as we receive them. Well, I’m not a painter, or a composer or an actor. But I was born with a dancer’s heart and when I experience art, there is a groundswell of emotion that reaches my soul in a way nothing else on earth can. And I know that I am not the only one who feels this way. I suppose that’s why have been supporting the arts for almost 40 years (which I hate to admit!). I began my career by managing my family-owned hotel, the Greenwood Executive Inn in Bowling Green. I spent 30 years there working with entertainers in the performing arts, bringing musical artists to Bowling Green. We had dinner theater with local actors. There was always wonderful entertainment nightly by our house band, Liberation, performing in our Nellie O’Bryan’s Restaurant and Gary Goodwin in our lounge. Bowling Green had not seen entertainment or entertainers like these before, and it set the stage to show that Bowling Green could support a tremendous venue like SKyPAC. Today, I am one of the owners, and am chairwoman of the board, for South Central Bank. Through the bank and personally, I continue to support SKyPAC, small local theaters and art education in our local schools through monetary donations and my time. To Andee Rudloff, a magnificent artist herself, what an honor it is to receive this award. I would not have done so if it weren’t for you, and I thank you from the bottom of my heart. I feel so fortunate to be able to support all types of art in our community. Art has no designated form, limit or boundaries, and is something that lives in us forever. So, I hope you will continue to support the arts with me. I’m deeply honored to receive the Milner Award, and I cannot thank all of you enough. Channeling the spirit of those of us whose intelligence shines most brightly through artistic expression – including the generations on top of generations of artists whose potential geniuses have been prematurely stunted or snuffed – I humbly accept this Kentucky Arts Council recognition. Channeling the spirits of artists such as Nina Simone and the Affrilachian Poets, I remind us of sista Nina’s words. Channeling James Baldwin, I share a reminder to those few of us who have positioned themselves to sell their own self-decency by selling the well-being of the masses in order to grossly overstuff their already grossly overstuffed coffers. Channeling Lorraine Hansberry, I have a reminder to those few folks who would then maneuver to silence the voices of everyone other than themselves, many times starting with the voices of the artists devoting their lives to reflecting their times. It is crucial that you understand it would be better for us all, including for yourselves and the future generations of your own offsprings, to develop nurturing institutions of learning that allow for artistic intelligences to push toward full potential. We never know from where genius might birth itself. We never know from where genius might sprout that will positively inspire us, in itty bitty ways or ways that might one day save us all from ourselves. The Western Kentucky University Photojournalism faculty and staff, both past and present, wish to extend our deepest appreciation to Gov. Matt Bevin, the awards selection committee, and all of the other good people who were involved in granting the Mountain Workshops this incredible honor. We also want to thank Liz Hansen, who nominated us for this award. Liz has spent many sleepless nights for many years volunteering her time and talent as a writing coach at the Mountain. We also want to recognize all of the other faculty, staff, participants, sponsors and communities who have given so much to the workshops over the past 42 years. No amount of thanks is adequate in expressing our appreciation. Everyone loves a good story. And though I’m sure everyone has heard or told a story or two at some point in their lives, perhaps the Mountain Workshops has taken this concept a little further than most. For 42 years the Mountain has been telling stories about Kentucky’s rich heritage, its beautiful landscapes and especially its incredibly warm, fascinating and genuine people. We have even snuck in a few communities in Tennessee along the way. When it began in 1976, the Mountain Workshops was just a humble photojournalism class project with a goal of documenting one-room schoolhouses in eastern Kentucky. I don’t think its founders could have ever envisioned a workshop that would evolve into a journalism education epicenter, drawing students and professionals worldwide, with the vision of engaging in a community and telling meaningful stories about its people, creating a historical document of this community and applying cutting-edge technology in the pursuit of sharing these stories with the world. But a story cannot sustain itself unless it is preserved, and therefore remembered. One initially unintentional but now-welcome result of gathering and communicating these stories over all of these years is that a tremendous historical record of Kentucky has been created. In a way, we are in the business of creating and preserving memories, of helping people to remember. Our hope is that we can continue making these memories for many years to come. I am delighted to take this opportunity to thank the Kentucky Arts Council for the amazing honor of this award for which I am MOST grateful! And for the outstanding support they have given me throughout my career. From awarding me Professional Development Grants, two Individual Artist Fellowships, sending me to Ecuador as a Cultural Exchange Artist and providing high-quality craft marketing and workshop opportunities, the Kentucky Arts Council has had a truly significant impact on my career. I, and many other Kentucky artists, have greatly benefited from the acknowledgement and validation of our work that this organization’s recognition and support has given us. It has helped instill pride and belief in work we might have otherwise doubted at times as being valuable to any besides ourselves. It is a vital entity promoting art and assisting artists to viably produce it. I am immensely grateful to the Kentucky Arts Council for recognizing how deeply art enriches our human experience and encouraging and supporting the creative spirit in those of us compelled to express it. On behalf of Centre College and its Norton Center for the Arts, we express our gratitude for the honor bestowed upon us with receiving the 20217 Governor’s Award in the Arts for Community Arts. The Regional Arts Center, now known as the Norton Center for the Arts, has a rich history of providing important, world-renowned artists to Kentucky’s Bluegrass region. In 1973, the center’s first director, Floyd Herzog, planned an exciting inaugural season, including a dance company from Siberia; poet, actor and singer-songwriter Rod McEuen; the Detroit and Cincinnati Symphony Orchestras, the Cincinnati Ballet Company and our own Kentucky Opera Association. He set the bar high. Years later, the next director, George Foreman, began to add more popular artists, such as Pearl Bailey, Ray Charles, Glenn Campbell and the Temptations and Four Tops to the mix of programs. George was also responsible for cocreating the Great American Brass Band Festival, a much-lauded, nationally recognized event. In 2010, I was privileged to pick up the baton of presenting world-class artists, while also finding ways to deepen these cultural experiences with students, artists and our community at-large. I always appreciate, and am inspired, when I hear comments from the community such as, “I remember when I was at the Norton Center and attended the Baryshnikov and Twyla Tharp performance,” or “I can’t believe I just jammed with blues legends Corey Harris and Eric Bibb,” or “Did I really just see Yo-Yo Ma in Danville, Kentucky?” or “My students loved having a master class with Bela Fleck.” Standing in the lobby after a performance and having people greet me, shake my hand, or give me a thumbs up; or say, “I had never heard of [a particular artist], they were great, please bring them back!” is probably the greatest reward of all. We carefully curate programs that connect students/citizens/communities through art, while always trying to build and maintain their trust. To do this, we focus on meaning: why are the arts important? What does this particular program have to do with me? We present diverse cultural programming and engagement experiences so we, as a community, can also learn from our differences. However, collectively, the Norton Center promotes a sense of inclusion and celebrates these diverse experiences together, as a broad-reaching community. Many Norton Center programs focus on content and context. We presented a residency featuring a brass quintet and string quartet that developed a program around the theme of Shakespeare’s “Romeo & Juliet,” including works by Tchaikovsky, Leonard Bernstein, and even Elvis Costello. We also presented a classical concert by the Australian Chamber Orchestra featuring legendary soprano, Dawn Upshaw. The program included, “Winter Morning Walks,” a new cycle of works created by jazz composer Maria Schneider for chamber orchestra, jazz musicians and Ms. Upshaw, that featured poems by U.S. Poet Laureate, Ted Kooser. We were thrilled to provide a post-concert talk for our audience with the orchestra’s musical director, Ms. Upshaw, and Ms. Schneider. The audience response to this new cycle of classical songs was beyond glowing. Having the opportunity to engage with the creative team was even more special. That our community embraced a new work of classical music so positively, even before it received three Grammy awards, was priceless. This award comes at a great time for the Norton Center. We have been building and celebrating community through the arts for many years, and receiving this year’s Governor’s Award in the Arts only pushes us to do even more. This year, we have developed programs that address a central theme facing communities around the world: conflict. Global conflict such as war. Personal conflict (in terms of external acceptance) such as ethnicity, religion, gender identity and race. Our programs provide context in how people respond to conflict by engaging with our series artists, including Jessica Lang Dance Company; Trace Adkins; the American String Quartet; poet and war correspondent Tom Sleigh; National Book Award winner and Marine Veteran Phil Klay; Latin-American bands Las Cafeteras and Orkesta Mendoza; the Broadway musical “RENT;” and photographer, filmmaker and Guggenheim Fellow, Sara Terry. Providing these types of contexts through community engagement bridges world-class and award-winning cultural leaders with a broad representation of our communities who might not otherwise attend performing and visual arts programs. Meaningful experiences also come from lectures and demonstrations by artists and introducing art forms to our youth. It is our belief that all children are youth-at-risk without the arts. By providing cultural experiences starting at a very early age, from those in gifted classes to basic comprehension courses, to STEAM classes, we help children to explore cognitive and critical thinking; discover forms of positive expression; and develop intentional interaction and communication. Centre College is a prominent four-year liberal arts college that fundamentally strives to ensure that its students develop cultural aptitude and creativity. The Norton Center continues to accept this great challenge to extend Centre’s mission throughout the Bluegrass community. From hosting the Governor’s School for the Arts to hosting two Vice Presidential Debates and debate festivals; from providing technically challenging master classes to creating the Arts for the Classroom Ticket Subsidy (ACTS) program that provides free tickets for public school students across 10 counties; from bringing in the top traditional artists to the leading emerging artists, the Norton Center provides meaningful ways to engage our communities with top artists. And with this Community Arts award, we have an opportunity to use this distinction to develop even greater access and community engagement. It is with deep appreciation that we thank Gov. Matt Bevin and the Kentucky Arts Council for this prestigious honor. Special thanks to Danville citizen and longtime arts supporter Wilma Brown for nominating the Norton Center, and to the entire Norton Center staff – past and present – who have worked hard for more than 45 years to bring entertaining, educational and engaging cultural programs to our Commonwealth. Thank you to President Roush and the Centre College Board of Trustees for ensuring that the Norton Center remains a vibrant and actively engaging resource for its students, faculty, staff and greater community. As this is a community arts award, it is important to offer the final thank you to all of the Norton Center patrons, friends, donors and supporters. We share this award with you, because of you! Thank you Governor Bevin and thank you members of the Kentucky Arts Council for honoring us with the Governor’s Award in the Arts Business Award. What a cool award for Kroger. This truly means more to us than you know. Kroger receives lots of accolades for our efforts to end hunger, women’s health, the USO and more but this has to be the most prestigious recognition from the arts community in our company’s 134-year history. At Kroger our purpose is to Feed the Human Spirit, and an important aspect of that is building stronger connections between our stores, our associates, our customers and our communities. Without a doubt, including locally created art in our stores helps build those connections. The very first Kroger murals were created in 2014 for our Euclid Avenue store in Lexington. Because of how popular those were, we have since commissioned and installed 34 murals in 25 of our Kentucky Kroger stores. And I’m glad to report there are more in the pipeline. Each mural reflects the community in a unique way and equally important, each one was created by a local Kentucky artist. And wow, do we have some amazing artists here! While it began here, Kroger now has more than 100 murals in stores all across the country. It’s a real point of pride for us that Kentucky led the way. I’ll close by sincerely thanking LexArts, Louisville Visual Arts and all of the artists who have been involved in these projects. The success here simply would not have been possible without their expertise, creativity and partnerships. I would like to thank the Kentucky Arts Council and everyone there for all the help they have given me in the past and present. I am very honored to receive the Governor’s Award in the Arts Artist Award. I would like to thank Gov. Matt Bevin and the Kentucky Arts Council for making the day very special for me. It has been my good fortune, in this life, to live as a poet. To read poetry, to write it, to teach it. And to have found long minutes in which to sit in meditation with poetry. What does this mean? Or, the “sublime.” When Longinus used the word “sublime,” he meant all that is noble and grand, generous and affecting. As with love, the feeling of having read a good poem induces a certain inner radiance. The poem sinks in and transforms itself from words on a page to a deep interior shift. Yoga teachers speak of a “rootedness.” I think that is a good word for what I am trying to describe. One feels anchored to the earth in a new way. The Harvard scholar Helen Vendler speaks of “reflection” as a proper response to poetry. And I agree with her. Quiet reflection is how I have often responded to poetry. I like the reading of poems, and I also like the states of mind in which they leave me. Louise Gluck, in her essay “Education of the Poet,” says, “I loved those poems that seemed so small on the page but that swelled in the mind.” Poetry, then, is a lovely fever. Every so often, I reread Basho’s poetic travelogue “Narrow Road to the Interior,” in part to be reminded of first things – friendship, awareness, the act of putting one foot in front of the other. I read Sam Hamill’s translation, from Shambhala. His version is pared down. Each little chapter reads like a prose haiku, or tanka. And, then, to look up from the page, and to gaze out at the muscular limbs of the pear trees that enclose my balcony – it is like taking a deep drink from a cold mountain lake. It is bracing. In the afterglow of Basho’s words, I feel at peace with the world, and a little bit moved beyond myself. Poetry may leave us, as it did Wordsworth, amid thought “too deep for tears.” And, those just might be tears of joy! Poetry educates the emotions, so we are freed from having to assess (drear word) or prove anything by it. The feeling that stays with us is the first important thing.